Barcelona is huge, but it has a modern and well-developed public transport to get quickly anywhere in the city. The metro, bus and tram all run at a very tight pace and until late into the night. In addition, there are several cable cars, funicular railways, railways, sightseeing buses, taxis, local trains, night buses and many other means of transport. The Barcelona Card also offers free and reduced admission to attractions. On our product page Barcelona Card you can find the list of included services. You may cancel the Barcelona Card and Hola BCN ticket up to six weeks after the booking, but not later than the 15th of January of the following year, unless you have cashed your voucher. Received and unused Barcelona Cards and Hola BCN tickets can be returned to us by the 15th of January of the following year. These must be in a resalable condition. The hop-on hop-off bus is a great way to quickly and easily get an overview of the city. You can hop on and off at more than 40 stops and visit exactly what interests you. You can book the tickets for one or two calendar days here. Book the package now: Bus Turístic + Telefèric. This will bring you to the top of Montjuic to enjoy a wonderful view. Services of the package "Bus Turístic and Telefèric"
The economy pack "Bus Turístic + Telefèric de Montjuïc" contains in addition to the above mentioned bus ticket service, roundtrip ticket (voucher) by cable car Telefèric de Montjuïc from bus stop "Teleféric de Montjuïc" to the Castell. Booking without risk: You can receive and receive any Barcelona Cards, Bus Turístic tickets and Voucher for the Teleféric de Montjuïc by post until 15.01. of the following year, we will refund the full purchase price. The booking for delivery by e-mail (voucher) can be canceled up to six weeks after the booking, but no later than 15 January of the following year. The austerity package "Bus Turístic + Telefèric" can only be canceled as a whole. If either the voucher for the bus Turístic or the voucher for the Telefèric has been redeemed, the booking can no longer be canceled, even if you have not used the other ticket yourself. Booking without risk: You can return your unused Barcelona Cards, Hola BCN tickets or Bus Turístic tickets and vouchers for the Teleféric de Montjuïc by post until 15.01. of the following year, we will refund the full purchase price. The economy pack "Bus Turístic + Telefèric" can only be canceled as a whole. If either the voucher for the bus Turístic or the voucher for the Telefèric has been redeemed, the booking can no longer be canceled, even if you have not used the other ticket yourself. Although Barcelona has a wide range of transport, it is still easy, fast and convenient to find your way around and travel in Barcelona. The subways, buses, trains of the FGC (Catalan commuter trains) and trams in Barcelona are one transport network. All you need is a ticket for almost all means of transport. 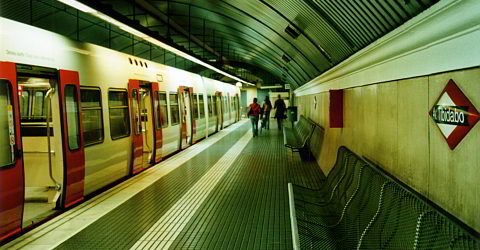 The metro network of Barcelona is very good and the trains go in a very fast pace. So you do not have to worry about timetables. Almost all attractions are within walking distance of a metro or tram station. Where there are no subways, the gap was filled by tram. Much has been invested in the accessibility of public transport. Thus, e.g. nearly all metro stations and buses are accessible to wheelchair users. You will find your way around the metro very quickly. If you have a specific destination, look for the nearest metro station and see which line goes there and what the terminus of the metro line is called. When you enter a metro station, all you have to do is know which direction you need to go. The directions are always indicated with the last stop. For example, the L3 line has the direction of "Trinitad Nova" and "Zona Universitaria". At metro stations, signposts are labeled with this terminus, which you simply have to follow until you reach the platform. the color of the corresponding line, for example green for the L3 line, so if you need to change at a station, it works the same way. Plan of Metro Line L2 with transfer points. A metro plan for download can be found on our download page. Each metro station provides a complete network plan and you also get them at the ticket booth for free. The Barcelona Card and the Hola BCN ticket also include a metro plan. Saturdays to Sundays continuous operation. Continuous operation even on 1st of January, 24th of June, 15th of August, and 24th of September. On December 24, the operating time ends at 23:00 clock. In the evenings, only one entrance to a metro station is often open. Outside metro times there are night buses (see below). The L9s line (to the airport) operates daily from 5am to 12pm. In Barcelona, ââover 230 bus lines are used. A network such as e.g. exists for the metro, is quite confusing and not practical. It is therefore difficult to say which bus will take you from A to B. If your hotel is a little further away from a metro station, you will definitely be told at the reception which bus you need to take. The bus plans are available at the tourist information office on request. The operating times of the buses are different for each line. You will find a notice board with the timetable at each stop. They leave from about 5:00 clock to about 22:00 clock. Both the metro and the buses do not run all night. In Barcelona, ââthere is a fairly dense network of night buses to get you back to your hotel all night long. Except for the line N0 all lines stop at Plaça Catalunya and can change there. The N0 line is a circular line that allows you to circle around the city center and change to the other NitBus. The night buses are operated by the private operator AMB. That is why the Barcelona Card and Hola BCN Ticket are not valid. The N17 line goes to the airport. The operating hours of the NitBus are also different for each line, but they run from about 22:00 to 05:00 clock. The FGC is the Catalan railway company that operates the suburban trains. The Renfe is the Spanish railway company. Trains run along the Costa Brava to Blanes, 50 km away, to the airport, along the coast via Castelldefels and Sitges to Tarragona. To the northwest the trains pass for exemple the monastery Montserrat. The lines meet in Barcelona, ââwhere they travel underground like the metro and are integrated into the public transport network. You will be able to find your way there as in the subways, partly there are also underground connections between the stations of the Metro, Renfe and FGC. Again, the tickets are valid. With the Renfe you come from the airport (see "Directions for arrival"). From Plaça Catalunya to Tibidabo and the districts of Gràcia and Sant Gervasi. For more distant places see "Getting to the cities of Catalonia". Here you will find the route map of the FGC, together with the metro network and the network of Renfe. The taxi is a fast alternative to bus or subway, especially at night when the subways are not driving anymore. There are countless taxis, the tariffs are quite favorable for central European conditions. Taxis in Barcelona are painted black and yellow, free taxis are recognizable by the green light on the roof. There are more than 4,000 taxis and 260 taxi ranks in Barcelona. But you can just wave a taxi to yourself, the taxi drivers have a trained eye for it. However, within 50 meters of a taxi rank, a driver may not stop to take you. At taxi stands you theoretically have the free choice of the vehicle, but the drivers will refer to the first vehicle in the queue and you have to take this then. In special circumstances, however, you can also take another taxi, for example because you need a taxi cab, credit card payment, etc. Note for tariffs T-3 and T-4 (overland trips): as the taxi is not allowed to take guests on the way back, the return journey will also be charged. There are also possible motorway tolls. The current fare is indicated by the number 1-4 on the roof of the taxis. From the airport to the city center a taxi costs about 30-40 €, depending on where you want to go and how the traffic is. In addition there are surcharges for the airport, luggage and possibly night drive. When driving off, make sure that the meter is switched on and insist on a receipt. Some taxis offer credit card payments. You will find the indication on the window, as well as the current tariffs. The two-story sightseeing buses run on three routes through the city. The pure travel time per route is about 2 hours, for the green east route about 70 minutes. Sightseeing buses will take you past most of the city's attractions. Ideal to get an overview and to look at one or the other attraction. You can always get on and off or change the route. Operating hours of the "Hop on Hop off Bus"
Buses leavedaily every 5-15 minutes (except on 25th December and 1st January) depending on the season. Buses start at 9:30 and run until 20:00 (April to October) or until 19:00 (November to March). The green route is in operation from the end of March 26th to the end of September. *With us you get the tickets for the Bus Turístic cheaper. At each station of the metro and FGC, you can buy tickets either at ticket machines or ticket booths. The machines can also be operated in English. In the bus you can only buy single tickets from the driver. With the tickets bought on the bus you can change to other buses, but not to the metro. Conversely, this is possible, i. E. you can change with a single ticket until you reach your destination. To change from the metro to tram or bus, you must put the ticket back in the access control or the validator. The transport network includes the metro, the TMB (not the two-storey sightseeing buses), the tram and the funicular to Montjuïc. With the Barcelona Card you have in addition to many perks at the attractions also free travel on public transport. As a rule, a ticket for Zone 1 will be sufficient. This covers the entire urban area, some suburbs and the airport by bus 46. Most of the city's attractions can be reached with it. The other tariff zones 2-6 serve the periphery and distant places. The seaside resort of Sitges, for example is located in zone 3, the popular destination Montserrat Monastery in zone 4, Malgrat de Mar in zone 6. The tariff zones can be found on the FGC website. In addition to the single ticket for exactly one route, there is the 10-card, the so-called "T10". This is recommended, because in Barcelona you use quite often the public transport. The T10 is significantly cheaper than 10 single tickets and is valid for 3 months. With the trip you can drive 75 minutes in all means of transport, including change. But as soon as you change the direction of travel, you have to solve a new ticket. The T10 is transferable and you can even travel with several people at the same time in subway, tram or bus. To do this, you must validate one trip for each person (insert them through the vending machines at the turnstile or in the bus input). Important note: If you have solved a ride, this is valid until the end of the ride. With a trip you can change as often as necessary. When changing the T10 must be put back in the access control or the validator. If it is still valid, then no trip is canceled. Barcelona's newest line connects the two airport terminals T1 and T2 to the rest of the city's metro network via the "Zona Universitaria" station. From there you can change to line L3 to get to the city center. The indicated prices apply in each case to tickets in tariff zone 1. For children from 4 years, the adult rates apply. * Within the validity period of a ticket of 75 minutes you can change in the transport network in one direction, also in other means of transport, e.g. from bus to the metro. Note: Bus drivers will only receive one-way tickets. The one-day and multi-day tickets are valid in all means of transport in the network (metro, bus, tram and FGC). The Tramvia Blau, the Blue Tram, to Tibidabo is world famous. The old-fashioned train went past Art Nouveau villas to the base station of the Funicular, which then goes to the summit and amusement park of Tibidabo. The Tramvia Blau is unfortunately out of service since the beginning of 2018. The Funicular remains accessible by bus. To get to the Montjuïc, you can take the funicular. From the metro you can change from the line 3, station "Paral·lel", into the Funicular. From the mountain station it is about 100 meters to the Fundació Joan Miró. The summit with the Castell de Montjuïc is reached by cable car, the Telèferic de Montjuïc. This is a cable car system, as it is known from the ski resorts in the Alps ago. Funicular: Autumn and Winter: Mo.-Fr . : 7:30 am to 8:00 pm. Sat., Sun. and public holidays: 9:00 to 20:00. Spring and Summer: Mon-Fri: 7:30 am to 10:00 pm. Sat, Sun and public holidays: 9:00 to 22:00. Telefèric de Montjuïc: The operating times can be found on our booking page for the Telefèric tickets. Funicular: The one-way ticket costs 2.20 €. The funicular of the Montjuïc is connected in the Tarifverbund the Metro, i. The metro cards and the Barcelona Card are also valid here. The cable car "Transbordador Aeri del Port" connects the Barceloneta district via the port with the Montjuïc. To the port-side tower you can either walk or take bus line 64 (direction Barceloneta) from the station Drassanes. The approximately 10-minute and 1,300-meter ride offers a beautiful view of the Old Port and the old town. The timetable may change depending on the weather or in case of a storm rides may be canceled. The gondolas leave about every 15 minutes. Note: the middle tower is closed for refurbishment until further notice. 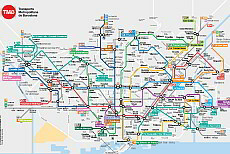 Here you can see a map of Barcelona with an overview of the metro network and it's stations. The cableway Telefèric de Montjuïc offers a unique panorama. Look over the entire city in bird's-eye view as you're driving up to the Castell de Montjuïc. Here you can rent bikes to explore Barcelona on your own. Since bicycle paths and parking spaces are available, the bike, as a comfortable mean of transport, is getting more popular in Barcelona. Both toursits and locals use the bike for getting around. Here you book the multi-day ticket for public transport in Barcelona. You do not have to worry about any tickets for 48, 72, 96 or 120 hours. The economy pack Hola BCN ticket + ticket for the Telefèric. Save money with the package with a multi-day ticket for public transport and Teleféric de Montjuïc. Please enter the number of required tickets and select the shipping method. Book the Barcelona Card here. You have free travel by public transport and many more free and discounted entries. With the Turístic bus you can get on and off at more than 40 stations. The public transport network in Barcelona is very well developed. You get almost everywhere with the Metro, there are more than 230 bus lines and another 30 night bus lines available, which are complemented by tram, funicular and cable cars. Metro: The metro network in Barcelona is very narrow, mostly barrier-free and absolutely reliable. The lines run in a tight cycle of up to 1:30 minutes. So you do not need timetables. Only for the metro L9 to the airport you need an extra ticket, but it is included in Barcelona Card / Hola BCN ticket. Buses of TMB: The route plan is a huge leaflet on which more than 230 lines and bus lines are drawn. It is a bit confusing. It's easy if you know the line number and know the name of the station where you need to get off. Trains: Within the city area you can use the local trains such as the Metro, you also drive underground. The Barcelona Card and the Hola BCN ticket are also eligible. Single tickets have to be bought separately. Tram: The tram network is also being expanded. It complements the metro network with several lines. NitBus: The night buses operate outside the regular bus and subway operating hours. The lines converge at Plaça Catalunya. For the NitBus you need an extra ticket. In addition to the extensive range of public transport there several other ways to get to the sights. Bus Turístic: The hop-on hop-off bus runs with short cycle times on three lines (two in the winter) to most of the city's attractions. You can always get on and off at more than 40 stations. There are tickets for one or two calendar days. Ideal for getting an overview quickly. Funicular: Take the funicular up to Montjuic from the metro station Parallel. For the Funicular, the Barcelona Card and the Hola BCN tickets are valid. To the Castell you will continue with the Telefèric. 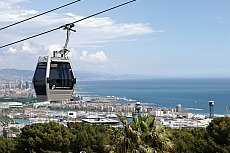 Telefèric: The cable car goes up to the Castell on the summit of Montjuic. While driving you have a wonderful view of the city. You need an extra ticket. Cable car Aeri: The cable car is visible from far away and takes you across the harbor. Tickets can not be booked in advance. You should expect longer waiting times. Taxi: These go everywhere in the city and can be called by a simple wave (at least 50 meters distance to a taxi rank).